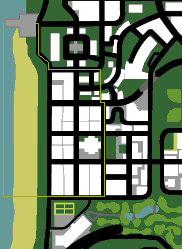 Map of Ocean Flats in Grand Theft Auto: San Andreas. Ocean Flats is a district of San Fierro, San Andreas, and comprises the southwestern portion of the city's coastline. This affluent residential district lies to the west of Hashbury and Garcia, to the northwest of Missionary Hill, and to the south of City Hall and Santa Flora. Ocean Flats is meant to emulate San Francisco's Ocean Beach. In fact, at the very southern tip of Ocean Flats lies the main building of Avispa Country Club, which bears a resemblance to Adolf Sutro's 1896 victorian Cliff House restaurant in San Francisco, which burned down in 1907. As its name implies, the Cliff House was situated on the cliffs of Ocean Beach, where the current structure also stands. Also, like Avispa Country Club's main building, the Cliff House eventually saw a highway (the Great Highway) constructed adjacent to it. A famous San Francisco landmark has also been re-created in Ocean Flats; The Cathedral of Saint Mary of the Assumption, in San Francisco's Lower Pacific Heights, has been emulated very faithfully, although on a much smaller scale. The cathedral is known jokingly to many San Franciscans as "Our Lady of Maytag", in reference to the cathedral's roof resembling a washing machine agitator. This page was last modified on 27 July 2012, at 14:34.